Some occasions call for a showstopper of a dessert; one that wows everyone. Such is the case when your little sister celebrates her -gulp- 40th birthday. My sister Jessamine, like most of us in our family, likes her sweets to be not overly sweet, so with that in mind, I created today’s Fig Pistachio Honey Goat Cheese Cheesecake. This cheesecake is gorgeous and looks like it took forever to make, but looks deceive; this is a tremendously simple dessert to make. The honey sweetened cheesecake combines classic cream cheese with a touch of goat cheese on a crust made from crushed gingersnaps, pistachios, and butter. If you eat gluten-free, as does my sister, you can easily make this entire recipe gluten-free with the 1-for-1 substitution of gluten free gingersnaps for conventional wheat-flour ones. The key to Fig Pistachio Honey Goat Cheese Cheesecake is the dead easy combination of several indulgent, extra-special ingredients. I’m making a big deal of this being a not-too-sweet dessert, but I am excited to say this is in the please-them-all category because the individual cheesecake slices are drizzled with mild, golden honey so your resident sweet tooth can adjust to their own liking. My little sis -because she will always be my little sister no matter how old we both get- loved her cake and so did her friends who came to help usher her into the fabulous forties, and I think you will, too! 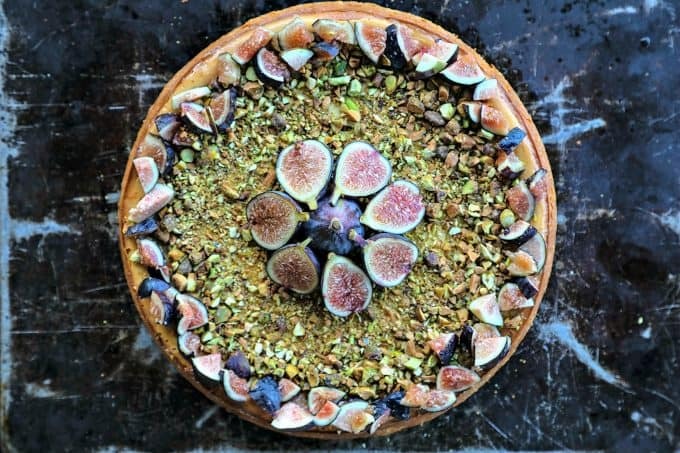 You do NOT need to purchase the most expensive goat cheese on the planet to make this Fig Pistachio Honey Goat Cheese Cheesecake. Any soft, plain Chevre will do. I love using the chevre goat cheese from ALDI for this. I do not advise using the “low fat cream cheese” or neufchatel for this Fig Pistachio Honey Goat Cheese Cheesecake, though. You want that bit of fat that full-fat cream cheese offers to offset the drier, leaner goat cheese. I find it easiest to purchase pistachio “hearts” or pistachios that have already been removed from their shells. It cuts down on the prep time for the pistachios. With these, all you need to do is measure 2/3 of a cup directly into the food processor and then 2/3 onto your cutting board rather than shelling all of them before measuring. When choosing your honey, be sure to choose a mild, light golden one. A stronger honey will compete with the delicate figs and possibly upstage them. Clover and orange blossom are two lovely honey choices for this recipe. When it comes to which fresh figs to use, choose whatever looks the best and most perfectly ripe. I love brown turkey figs when I can find them, but any good fresh fig will do! 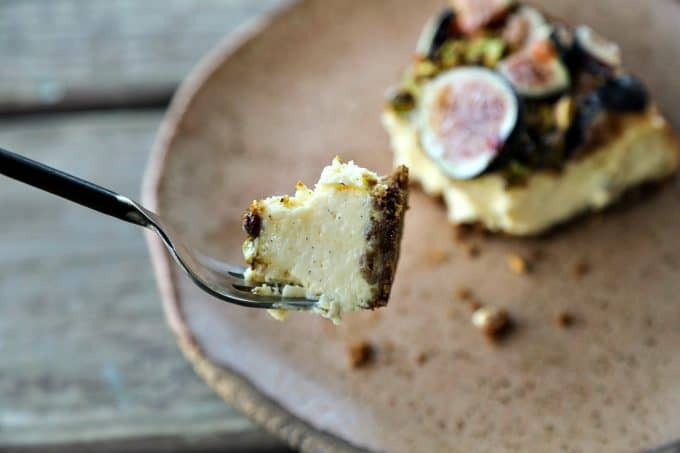 Ultra-creamy, not too sweet, and a feast-for-the-eyes while still being simple to make, this vanilla bean flecked Fig Pistachio Honey Goat Cheese Cheesecake is a show stopper! Position the oven racks on the bottom third and middle third. Place an empty metal cake pan on the bottom shelf.Preheat oven to 300°F. Bring a kettle of water to the boil. Line a 9-inch springform pan with parchment paper, spray the sides with coconut cooking spray, and set aside. Fit a food processor with a metal blade. Add 2/3 of a cup of pistachios, fix the lid in place, and pulse 14 times. Add the gingersnaps and continue pulsing until the crumbs are the texture of fine bread crumbs. Add the melted butter and pulse until the mixture resembles wet sand. Scrape into the prepared springform pan and press evenly and firmly over the bottom of the prepared pan. Wipe the food processor and blade clean with a paper towel and replace on the base with the metal blade. Add the softened cream cheese and chevre and process until smooth. Add the honey, sugar, eggs, and scraped contents of the vanilla bean to the food processor and fix the lid back in place. Process until smooth, stopping the processor once or twice to scrape down the sides. Pour into the prepared springform pan with the crust. Place the springform pan on a rimmed half sheet pan. Slide the half sheet pan on the top rack. Pour boiling water from the kettle into the empty cake pan on the bottom shelf. Close the oven and bake for 1 hour, or until the outer 2/3 of the cake are set and inner 1/3 is jiggling when the pan is gently shaken back and forth. Turn off the oven and prop the door open a couple inches. Let the cake cool for an hour in the slightly opened oven. Lay plastic wrap directly on the surface of the cake and refrigerate overnight. Gently unlatch the springform pan and push the bottom up through the sides to release the cake. Lift the parchment to remove the cake from the base, then fold back the paper as you slide it onto a serving plate or cake stand. Finely chop the remaining 2/3 cup of pistachios. As you lift the larger pieces, the finer ones will fall to the cutting board. Arrange the more robust pieces of pistachio near the outer edge of the cheesecake, leaving a 1/2-inch border on the outside. Sprinkle the finer chopped nuts inside the ring of larger pistachio pieces in toward the center of the cheesecake. Position one whole fig at the center of the cheesecake. Halve 4 figs from top to bottom and arrange those -cut sides out- around the whole fig. 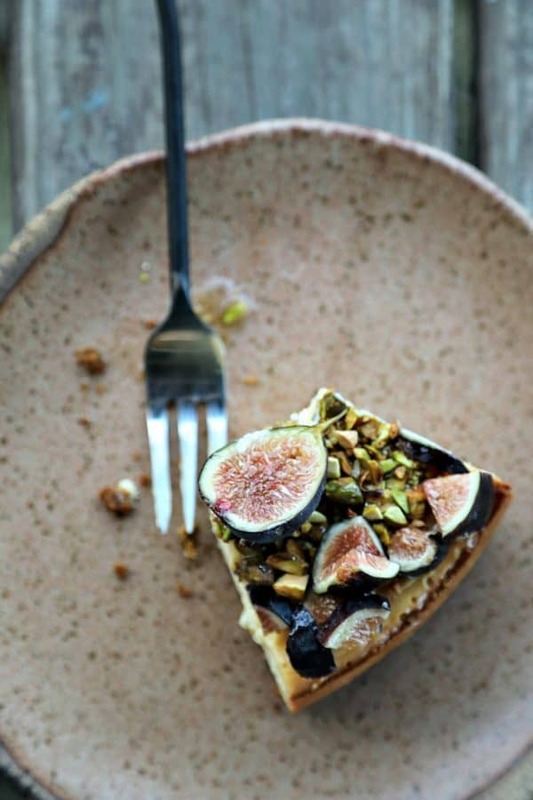 Chop the remaining figs into small pieces and arrange on the very outer edge of the cake. Drizzle the whole thing with about 1/4 cup of mild honey. Slice and serve with additional honey, to taste. 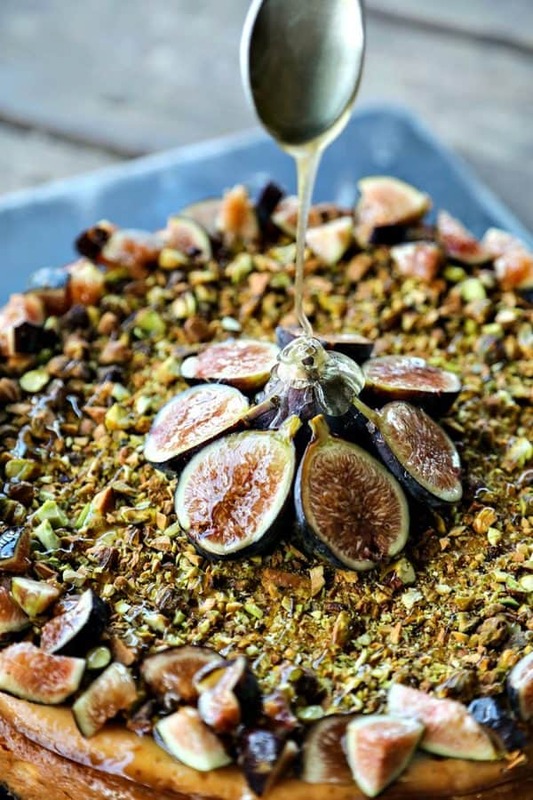 im inspired by this combination of fig, pistachio, honey and GINGERSNAPS…but, why goat cheese? Is it possible to just use more cream cheese or possibly a creamy Brie? I have had too many bad experiences with goat cheese. Taste. Smell. Texture. Can’t go there. What do you suggest? Why goat cheese? Because it adds a savouriness to the creaminess and sweetness. Feel free to substitute in an equal amount of cream cheese, but the goat cheese is quite mild in here! I’ll keep you posted on this one. We don’t have an ALDI near us but maybe I can get a good recommendation from the cheese counter at Fry’s. My parents have an amazing fig tree and I’m hoping to harvest some for jam and this cheesecake! 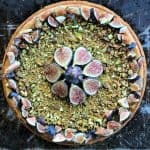 what an interesting cheesecake, have made some unique ones too like lobster cheesecake, but this is really creative and haven’t seen anything like it before, love the figs, and the goat cheese, so thank you for this recipe! Question, for the honey could you use a truffle honey? Hi there, An. I have not tasted the particular truffle honey you refer to, but I’m not inclined to think that truffle scented/flavoured honey would be to my taste here. Yup, it works with truffle honey as that’s what I did. It makes sense because all these things, including truffle honey, would work together on a cheeseboard. Thank you so much for this recipe!! My friend is just like your sister so it was perfect for her birthday as well. I went a step further on the indulgence factor and topped it with truffle honey (because she loves truffle honey). Anyway your recipe was so easy to follow and spot on. It was an absolute smash hit at the birthday party. Will definitely be making this again!